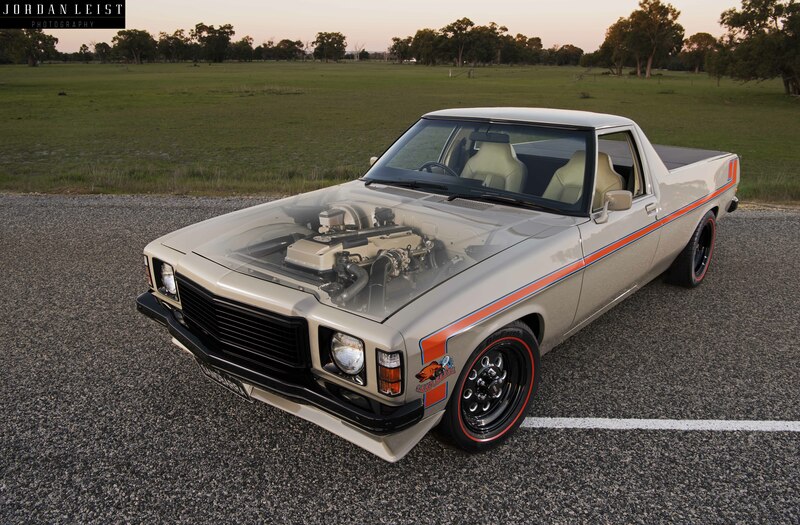 The reaction to Chris Dicker’s HZ ute could best be described as polarising. With the bonnet shut, most people would just see a pretty tidy Sandman ute, then they’d probably figure out that the Sandman stripes seem to morph into an XW GT stripe at the front of the car. With the bonnet up, the lightbulb moment happens a bit more quickly, as people can clearly see that the straight-six engine is most definitely not a 202! It is funny how worked up people get when someone uses a non-original engine in a car. In some scenes it’s not an issue at all – hot rodders have been doing it for years – and let’s face it, all engines are basically the same, it’s just the name on the rocker cover that changes. Chris has another way you can look at it: “Some people can’t seem to get it through their heads that this is actually an Australian-built and designed Ford engine in an Australian-built Holden – it’s not an LS. You just can’t preach to them; I just let them go.” What would be really interesting is to see how many of the detractors are running around with Ford Top Loaders and nine-inch diffs in their Holdens! But that’s enough about the haters, the real question is: Why would you? “It started out as a project to do with my young bloke,” Chris explains. “It was rusty enough that we were going to chuck a couple of patch panels on it, blow a bit of white paint on, turbo LS – it was partly inspired by the ‘Farm Ute’ [of John Di Mauro] that was running around over east. It morphed into a bit of a tick-the-box-and-send-the-stuff project, and I couldn’t do it. It wasn’t going to impress anyone; it wasn’t going to impress me. After ringing a few people and not getting much support for his idea, Chris rang Walliston Wreckers and picked up an FG turbo motor with about 70,000km on the clock and a ZF six-speed auto gearbox. He was committed now, especially after creating the Facebook page that went live in October 2016. With the car making its debut at the WA Hot Rod & Street Machine Spectacular in June 2018, the project took a little over 18 months, and because he likes to keep himself extra busy, Chris also started up a new business – Dicker’s Speed Shoppe – so the car has become a bit of a rolling billboard for that. Although Chris was replacing a six for another six, there was still quite a bit of work to get the engine to fit, mostly to do with modifying the sump, but also to ensure that the whole engine stayed under the bonnet. “The main issue is, the oil pump is driven off the front of the crank and the oil pump pick-up comes directly down behind the balancer with a ¾-inch tube, then goes all the way to the rear of the sump. It sticks down from the bottom of the block a long way,” Chris says. This created all sorts of headaches with steering clearance, so Chris came up with a solution to make the pick-up take a 90-degree turn towards the side of the block. He also swapped out the steering box for a Torana rack-and-pinion. To mount the engine, Chris used a set of Tuff Mounts, and while there isn’t an official off-the-shelf kit, they dubbed the parts supplied a ‘Barrahore’ kit. “They sent me Ford mounts for the engine side and Holden for the other and said: ‘You can work it out.’ I had to retain the crankshaft centre height to make sure everything lined up with the driveline,” says Chris. The engine was still in pretty good nick, but it copped a bit of a freshen-up with new billet oil pump gears and stud kit from Atomic, as well as some fresh valve springs, new timing chain, new tensioner and new gaskets for good measure. With all of these late-model, computer-controlled engines, you’ve got to make sure you get all the wiring right, especially when it comes to the gearbox, otherwise you ain’t going anywhere. There’s no point changing something just for the sake of it, so Chris even used the factory shifter and console, so he can either let the ’box do all the work or flick the shifter across and bang through the six gears manually. The rest of the interior is pretty much GTS spec in the factory Chamois colour to tie in nicely with the Savannah Ivory Beige exterior paint, with the only change being a boost gauge in place of the clock. It’s even got a/c and a heater tucked up behind the glovebox, which is only about three inches deep now, but had the added benefit of removing the blower motor from the engine bay. What sets this car apart is that Chris had a vision from early on, even getting renderings drawn up to try out different concepts. The end result being so close to those initial drawings shows how committed Chris was to coming up with a theme and sticking to it throughout the build. This got Chris thinking, so he spoke to Shane about the ideas he had rattling around his head, and after being sworn to secrecy, Suncity developed the renderings and SandBarra stripes and logo. “We went back and forwards, trying things like a black vinyl roof, blacked-out window frames, mirrors and door handles – all sorts of concepts so we could say: ‘No, don’t like that.’” That trial-and-error process is much easier and much less expensive on a computer than it is in real life, and the reason the car ended up looking just like the final rendering. Chris admits he could have gone a lot wilder – maybe a lower stance, fatter wheels, a bunch more boost – but this car has been built as a reliable and legal cruiser for the street, with Chris consulting an engineer for the entirety of the build process. It might sound like Chris is getting old, but if he keeps turning out cool cars like this, bring it on!